Card Wars Kingdom APK is now available and the current version is 1.0.8. If you are a fan of Adventure Time show, this is good news for you because this game is new series that comes with some interesting features. Currently, there are a lot of TV show games made by Cartoon Network, but it does not make developers stop working. Actually, this game is a sequel to the first Adventure Time: Card Wars. This game brings turn-based card game genre where you can summon monsters and spells. Each monster also has an effect. Gameplay of this game looks like the first series. You are required to prepare and collect the card deck in order to become the best player. There are many types of cards in this game. Starting from deployment mode, you can choose the card on the left to deploy your troops. There are 4 cards which can be used to deploy troops so you have to use it wisely. After that, the game will start and you can use your existing card in front of you to attack the enemy or strengthen your monsters. Winner of the game is the player who can destroy all the enemy monsters. You can also fight with another player or entering the tournament mode. 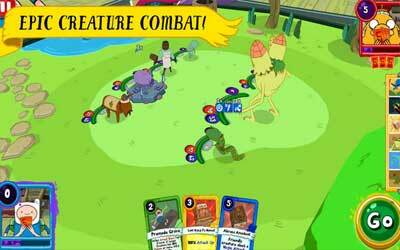 Assemble a team of awesome creatures and fight for Card Wars glory. Unleash the power of spells, landscapes, and flops. With an all-new card combat system, smiting your enemies has never felt so good. This game is not like the first card games. You can download this game for free and play it on your Android, but still there are in-app purchase and ads in it. Test your skills in the Strike dungeons. Earn rare cards and loot from across the kingdom. Awaken your Creatures to unlock new Stats, Abilities and Appearance! I’ve been waiting this game and so far it’s amazing, perfect, just like in the first episode. It has lots of fun and good graphics and I feel amazing about it. This game can be very fun if you have good wifi and time to play.